Hastings-Lennox and Addington MP Mike Bossio speaks to the audience about the costs of climate change during a town hall style meeting held in Selby on Saturday. Photo by Adam Prudhomme. 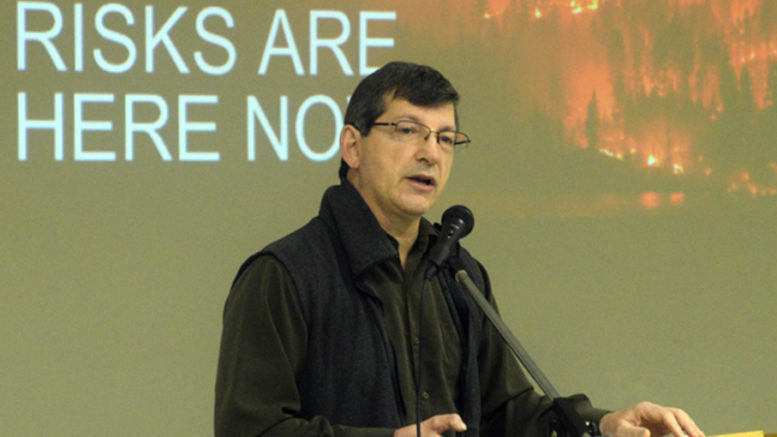 On the eve of the new federal carbon tax taking effect in Ontario, Hastings-Lennox and Addington MP Mike Bossio was at the Selby Community Hall to talk climate change. The town house-style event on Saturday was well attended and featured the MP explaining why he felt taxing pollution would be a key component to his Liberals’ party plan to fight climate change. Bossio referenced a report published by United Nations scientists who warned the human global population has 12 years to address climate change to limit its catastrophic effects. He also pointed to the last three summers, where his riding saw its worst drought in recorded history (dating back to 1880) in 2016, flooding in 2017 that saw Lake Ontario ride three feet to last year where the season started dry before ending with floods. Taking care of the environment isn’t just the responsible thing to do says Bossio, but he says the math supports it as well. Bossio says his Liberals have a plan that includes over 50 measures to address the issue. Bossio also spoke of a cap and trade system for heavy industries as well.